According to the Tax Foundation, federal income tax compliance costs were projected to reach $392 billion by 2011, and $483 billion by 2015. Now they say it’s probably in the ballpark of $400 billion as of 2011. So in other words, they figure that it costs taxpayers an additional 20 to 40 percent of the amount paid in income taxes just to fill out and file the forms. However, what people echoing these numbers overlook is the fact that these figures are based on Internal Revenue Service estimates made during an era in which tax forms were completed with a tax booklet, pencil and calculator, a methodology that even the IRS discontinued in 2006. The fact that the Tax Foundation assigned a dollar value to outmoded time estimates, based on a taxpayer’s average hourly earnings, is even more appalling. The real eye opener ought to be that a huge chunk of the dollar cost mentioned is not money that anyone actually spends. It is rather the value placed on the time each taxpayer would spend preparing their income tax return if (1) they actually prepared their own tax return, (2) they prepared their return with a tax instruction booklet, paper forms, a pencil, and calculator, and (3) they were compensated for their time. 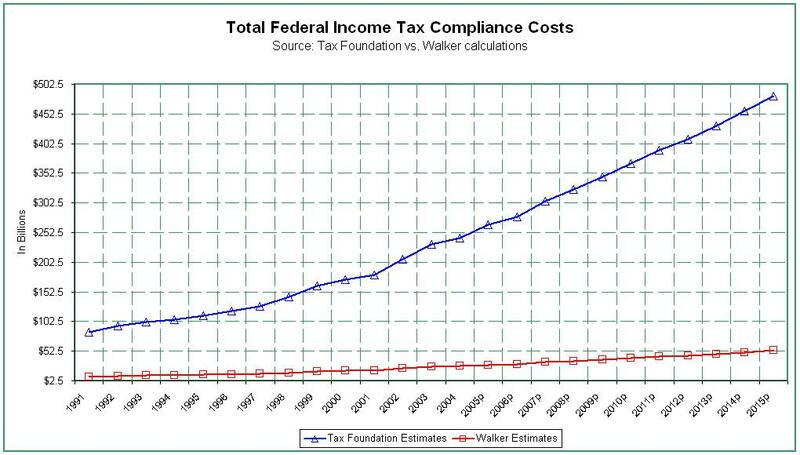 To prove just how bogus this figure is, I pored over the Tax Foundation’s 2005 report. The first thought that occurred to me is that the reason the report hasn’t been updated since then is because the IRS stopped estimating the time it takes to manually fill out tax forms in 2006, and without these estimates, the Tax Foundation’s theoretical foundation disintegrated. And why did the IRS stop making these estimates? Well, primarily because since it began accepting electronically filed returns in 1990, and set a goal of achieving – “80% of all tax and information returns filed electronically by Filing Season 2007″, and with the advent of personal computers and cheap software, the amount of time spent and cost of preparing income tax forms has declined dramatically. Thus, the idea of one toiling for 17 to 23 hours, or longer, over a 2 to 3 page tax return is passé. What the Tax Foundation is saying is that a person with $20,000 of adjusted gross income would incur a cost of $1,180, or 5.9% of their income, in preparing their income tax return, and a person making $200,000 would expend $1,000, or 0.5% of their income. Does that match your experience, because it’s complete nonsense from my vantage point? Is this even remotely reasonable? Let’s examine this theory in more detail. Following the Tax Foundation’s logic, we could assign a cost to virtually everything we do, as a function of our annual income. Never mind the fact that we only get paid for the time we actually work. So in other words, if you make $9.61 per hour on the job, and it takes you 2 hours per week to wash your clothes (on your time off), then according to this theory, the real cost of clothes washing is more than $1,000 per year ($19.22 times 52 weeks; plus washing powder, water, electricity, and depreciation of your washing machine and dryer), or more than 5.0% of your annual income. Carrying this through to its illogical conclusion, for a person who works 8 hours per day, the cost of sleeping 8 hours per night would be equal to their annual income, right? So one can only ponder the cost of watching television, driving to and from work, mowing the yard, etc… You can see how silly this is. To drive the point home, under this theory, if you work 8 hours per day, and have 16 hours of free-time, then the cost of everything you do outside of work would be twice as much as your annual income. In other words, you’re not actually making $20,000 per year, heck, you’re not even breaking even; you’re going in the hole by $20,000 every year. Well, so much for that theory. I have had the fortune of preparing income tax returns, both in the early 1980’s, before the advent of personal computers, and in the 21st Century with high speed internet and gigabytes of random-access memory. In the early 1980’s it took literally days to complete a complex income tax return. Information would be gathered and written onto data forms in pencil, then shipped off to a main-frame computer processing center. The printed return would then be mailed back in about 3 business days, although a typographical error would easily double this time-frame. Then the taxpayer(s) had to be summoned to come in and sign the return before it could be postmarked. The cost of preparing an itemized Form 1040 with Schedule A, plus a state tax return, back then averaged around $150. Most non-itemized returns were completed on the spot, with pen and calculator, for around $85. What some people miss is that since $150 in 1981 had the same buying power as $380 today, annual inflation over this period being 3.16%, and since the average cost is still around $150 today (in the Southeast), the cost of preparing income tax returns has actually declined by around 61%, over the past 30 years. But you won’t hear about this from today’s rubber stamps. It was in 1990 that IRS e-file became operational nationwide, and that year 4.2 million returns were filed electronically. I was working for the IRS at the time. Later on, when I started my own practice back in the year 2000, after doing other things for a few years, part of my mission statement read, “To assist the Internal Revenue Service in its goal: ‘To have 80% of all tax and information returns filed electronically by Filing Season 2007’”. 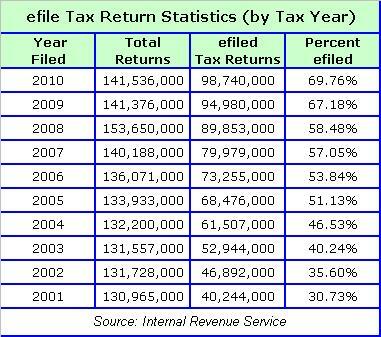 By the year 2007, as per the table below, the percentage of electronically filed returns had only reached 57%, however, many practices, such as mine, were already near the 100% mark. As a result, ever since then, that part of my mission statement has read, “To file 99.9% of all income tax and information returns electronically”. Nowadays, a tax preparer, who prepares more than 10 returns per year, is required to file all returns electronically. From personal experience, these days it takes about an hour to prepare and e-file the same income tax return that used to take 3 days or longer. Like in many other industries, technology has made tax compliance both cheaper and more efficient. While prices have risen dramatically in other sectors, such as Education and Health Care, the cost of professional income tax preparation has plummeted, on an inflation adjusted basis. Most notably, the time it takes to prepare a return has been reduced from days to minutes. Similarly, the time it takes to receive an income tax refund has been reduced from 6 to 8 weeks, down to 7 to 10 days. This is precisely why the IRS no longer publishes obsolete manual computation time-frames. 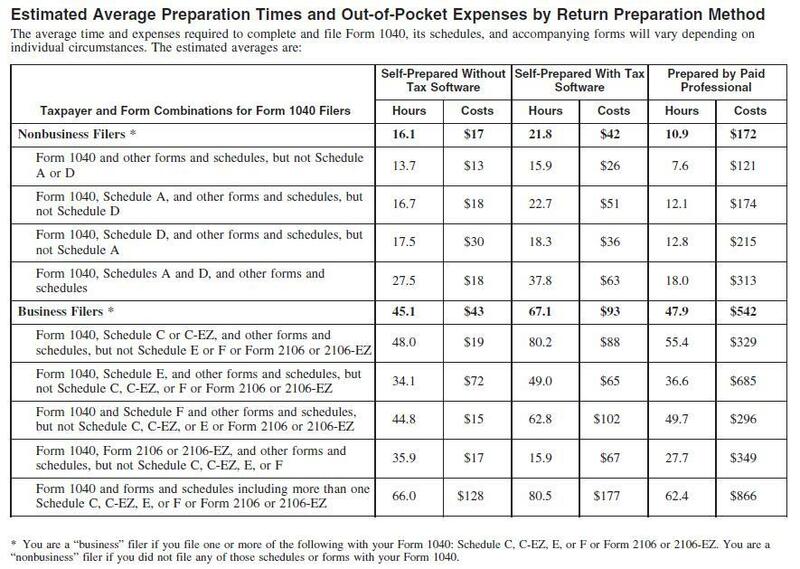 In analyzing this, does anyone out there seriously believe that it would take 6 hours longer to self-prepare a tax return with software, than without? Like that makes sense. And what kind of practice would a professional be running, if it took 12.1 hours to complete each itemized 1040 return? At that pace, a professional would only be able to complete around three 1040 returns per week, and since the regular season only lasts about 12 weeks, would only be able to prepare around 40 returns per season, with a seasonal income of around $6,900. If it really took a professional 12.1 hours to prepare each an every itemized Form 1040, we would indeed have a problem. However, since actual facts and figures reveal that tax preparation really takes a fraction of the time it used to, and costs less than half of what it did 30 years ago, perhaps we don’t have a problem after all, at least not a ‘cost of income tax compliance problem’. According to Nickel, over at the fivecentnickel.com, his research coming from the National Society of Accountants biennial survey, the average tax preparation fee for an itemized Form 1040 with Schedule A, plus a state tax return, was $229 in 2010. And for a Form 1040 and state return without itemized deductions, the average price was $129. But keep in mind that tax preparation fees vary regionally, so the above averages aren’t necessarily applicable depending on where you live. The lowest costs are in the Eastern South Central region (AL, KY, MS, and TN) where a Form 1040 with a Schedule A and state return averages $137. And the most expensive region is the Pacific (AK, CA, HI, OR, and WA) at $292. Here in the Southeast, a professionally prepared itemized Form 1040 with Schedule A, plus a state tax return, takes about an hour to prepare, and the fee averages $150. The question of whether a person making over $200,000 will pay more, or less, is actually not based on their income, but rather on how many forms need to be prepared? So if an itemized Form 1040 with Schedule A, plus a state tax return, costs an average of $150 to prepare, that’s generally how much it costs no matter how great one’s income. That’s because the time it takes to prepare such a return would be about the same. If it costs more, it’s most likely due to additional form filing requirements. Thus, the true modern day cost of $150, to prepare such a return, is a far cry from the Tax Foundation’s estimate of $1,000. At the same time, a basic Form 1040-A, plus a state return, would take around 30 minutes to prepare, with an average fee of $85 ($60 without the state). This is also a major discrepancy from the Tax Foundation’s estimated cost of $1,180, for a person making $20,000 per year. If we were to follow this artificial tack, then we would have to believe that it would take something in the order of 122.7 hours to prepare a basic 2 or 3 page 1040-A return, at a cost of $9.61 per hour (the hourly wage for a person making $20,000 per year). Therefore, the Tax Foundation’s purported $400 billion per year estimate is grossly overstated. The act of basing an entire tax reform platform on factitious information is called, “fraud”. So who’s been out on the stump quoting these make-believe numbers? Of late, it’s been Mitt Romney, Rick Perry, previously Herman Cain, and a host of others. But it’s time for the public to wake up and realize that the Tax Foundation’s figures are completely bogus. Sure, some returns take longer than others, some cost more than others, and most businesses require monthly or quarterly accounting and payroll tax services on top of income tax return preparation. But what’s the alternative for a business, to not have any record of whether it is profitable? Can businesses just do away with all record keeping and financial reporting for the sake of skimping on an ordinary and necessary business expense? I don’t think that would be a wise move. To conclude, the Tax Foundation’s estimate is a made-up number, based on obsolete data. The true costs of complying with federal income tax laws have declined dramatically over the past 30 years. Thus, anyone floating figures ranging from $400 billion to $500 billion per year must have their head in the sand. There’s no way you could ever convince me that it takes 122.7 hours, to enter the amounts contained on a W-2 Form into a computer program, or onto a paper form, in order to file a simple 1040-A return. Nor can you persuade me to believe that the cost of preparing such a return could ever reach $1,180. But that’s essentially what the Tax Foundation’s report says. The correct method of determining any cost is to add up the actual outlay in cash, but since the Tax Foundation has not chosen this method, I must conclude that their estimate is overstated by as much as 88.9%. How did I arrive at this percentage? By sampling. The 2005 IRS out-of-pocket cost estimates reveal that the most one would pay is charged by tax professionals. Since the fee charged for a simple 1040-A, plus a state tax return, completed by a paid preparer, is actually $85, not $1,180 as they would have us believe, the Tax Foundation’s estimate is off by 92.8% ($85 vs. $1,180). And since the cost of a professionally prepared itemized Form 1040 with Schedule A, plus a state tax return, is actually $150, instead of $1,000, they are off by 85% ($150 vs. $1,000). Averaging these two percentages together results in an overstatement of 88.9%. Thus, I conclude that the Tax Foundation’s estimate, that federal income tax compliance is costing Americans around $400 billion per year, is in reality probably less than $44.4 billion (11.1% of $400 billion). Frankly, I would be more concerned about real and verifiable IRS statistics, such as the number and amount of refunds being doled out. For example, in 2010, out of the 142,449,000 returns that were filed, 109,376,000 received refunds totaling $328.4 billion, for an average refund of $3,003 per return. Now that’s real money, which, if you think about it, is being summarily piled on to the national debt. So what’s up with that? ← What Does $40 per Week Mean To You? Revised: I split up the paragraphs to make this easier to read, as I too find long paragraphs to be tedious. Perhaps I should not have combined the 1040A and 1040EZ forms together, but the reason I did is because the Tax Foundation stated that, “costs are regressive at 5.8% of income for a person making less than $20,000”, which I find to be ridiculous. 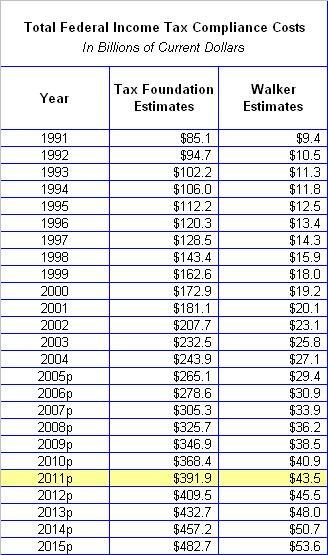 If you look at the report and Table 4 again, you will see that it represents totals for the year 2004. If you then compare the 2004 total to their 2011 projection, you will note that the 2011 estimate is 61% higher than the 2004 amounts, which are shown in the other Tables. Since I am talking about their $400 billion estimate for 2011, you must multiply everything on those tables by 161% to be on par. Did I not mention that the report hasn't been updated since then, because it's basically obsolete? Then if you take the 13.6 hours for a 1040, plus the 5.6 hours for a Schedule A you will arrive at a 2004 cost of $752, which equals $1,210 at the 2011 rate. So my report is right in the ballpark. The Tax Foundation's projections are overstated by more than 88.9%. The fact that I used their own percentage of income method against them may change the semantics, but it doesn't change the end result. Now excuse me, I have to download a year's worth of bank transactions into Excel, which should take about 10 seconds. Then I have to print out copies of my canceled checks…. Oh, I forgot, I don't write checks anymore. What used to take days now takes minutes, for me anyway, I don't know about everyone else. You should direct that question to the Tax Foundation, who themselves admit that a 6 year projection is pretty much bogus (see 1st link). Really? You mean like where it costs $85 to do a return containing -0- tax but a combination of refundable tax credits resulting in a refund of $3,003 or more? Or where a Corporation would owe taxes had it not filed a return and taken advantage of Section 179 or Bonus Depreciation, which had it not taken advantage of would have resulted in a huge liability? It works both ways. No, because I would never be foolish enough to prepare a stand alone 940, or just quarterly state UI returns. I only provide full service payroll including all quarterly and annual filings, and the rate is based on the number of employees. But I also only offer payroll services in conjumction with monthly or quarterly accounting services. So I don't charge per se for payroll tax forms based on some flat rate, but rather as part of an overall package based on various factors. The less work, the lower the fee. What is the percentage for filing where no tax is due, but would have been due had one not filed and taken certain credits? What is the percentage for filing where a huge refund over and above the amount of tax withheld is received for a nominal fee? What is the cost of not filing at all in terms of trying to get credit to buy a home or car in the future? Isn't that about it would be, if it took as long to complete a return as the Tax Foundation surmises? But seriously, you must be assuming that every accountant and attorney in the country does income taxes. I wasn't even remotely involved with taxes when I was in corporate accounting. There was accounts payable, accounts receivable, EDI, cost accounting, SEC compliance, reporting for credit purposes, reports to management and shareholders, and a host of other tasks completely unrelated to taxes. There also aren't many attorneys in the tax industry as most that I know specialize in criminal, civil, immigration and such. So that's a stretch, and no where close to what I said. But I guess it's perfectly reasonable to assume that a person who makes $8 per hour would be able to count the time it would take to do his own return back in the stone ages, at $35 to $56 per hour. Nevermind that IRS free-file is out there at no charge. According to the last link in my post (where I said, I would be more concerned about real and verifiable stuff), out of the 98.7 million returns that were e-filed in 2010, 63.8 million were filed by professionals, and 34.8 million were self-prepared. There is also IRS Free-File where many people have been able to efile their own return at no charge, if they meet certain criteria. So in this day and age, where the TF says it's costing that person making less than $20K — $1,180 or more, it may not be costing them a dime. Many also get assistance from volunteers at no charge. Maybe I'll conduct my own study in the future, but my point is that their estimate is way off the mark. That's where I stand, and there are many who agree. “That's the best we can do.” ~ The tax Foundation. No, under my theory, the amount actually paid out, in real dollars actually spent, is around $44.4 billion. Since 2010, everyone who prepares tax returns for a fee, must now register for a PTIN with the IRS, including office assistants who may not actually prepare returns. So we know there are around 900,000 in the tax preparation industry (awaiting for latest figures). Thus, under my theory the average pay for tax preparers would be around $49,333.33. However, the average salary for tax preparers is actually $36,000. Meanwhile, the average seasonal H&R Block preparer makes $9.67 per hour, or slightly less than $20K per year. As far as small business record keeping, we do the bulk of that here. Only about 4% of my business clients actually do their own accounting with QuickBooks. Most have better things to do, like running their companies. For another small percentage, from my perspective, I would hardly call throwing every last receipt they can find into a shoe box, and dropping it off on my doorstep, a huge drain of time and resources. It was like that 30 years ago, and it's still the same today. Bottom Line: $44.4 billion is reasonable; $400 billion is outrageous.